These are the rare Orange back design. 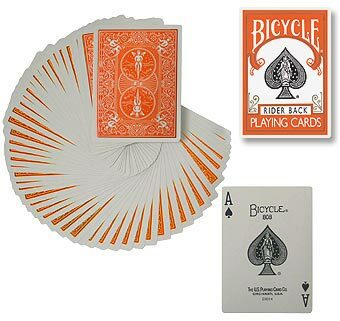 Bicycle Deck (808) Poker Orange The Bicycle deck is the best basic deck in the world. Used extensively by magicians and card workers. If you ever see a deck of cards in a film you can almost guarantee that they will be a pack of Bikes.